PBF Energy: Sophisticated Investors Have Doubled Down, Should You? This article was originally posted on Seeking Alpha. Since the article was published, PBF has dropped 14% while VLO has fallen 2%. Seth Klarman’s Baupost Group has recently increased holdings to 16%. PBF has grown through skilled acquisitions but faces a tough refining market. If you believe refined crude margins will recover, PBF is a solid value play. 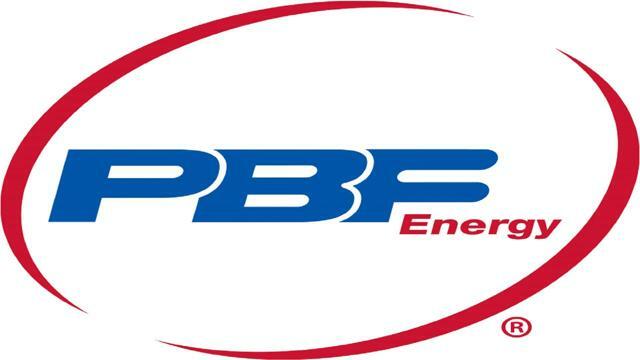 PBF Energy (NYSE:PBF) is a New Jersey-based petroleum refiner with a throughput capacity of 884,000 barrels per day. As the owner of 5 facilities, the company has a market capitalization of $2.3 billion at the recent price of $22.65. PBF is less than half the size of industry giant Valero (NYSE:VLO), but the company has made two recent acquisitions that have vaulted the business up the league table of refiners. However, many recognize PBF not for its refining capacity, but for its largest shareholder: Seth Klarman’s Baupost Group. Klarman is a disciplined value investor with one of the finest track records in the industry. Early in September, filings showed that Baupost had increased its stake to 16%. Klarman seems to be doubling down on his bets on PBF after the company’s shares have fallen by 35% since April. Notably, PBF’s CEO Tom Nimbley also added shares. Following the moves of hedge fund wizards like Klarman can seem like sage advice, but is PBF right for your portfolio? The jury is mixed. The case for investing in PBF rests upon its shrewd acquisition bets and a stock price that trades at net asset value. The case against PBF is largely an industry wide challenge: refining margins have been under pressure in 2016. While crude stocks have shown recent declines, gasoline inventories have increased. Finally, a comparison with industry giant Valero indicates that PBF needs to improve internal cost structures in order to gain market recognition. 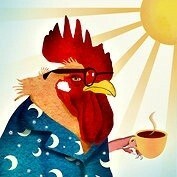 PBF was hatched from a private equity deal by Blackstone. Taken public at the height of the oil boom, Blackstone and other original private owners have reduced their LLC position to about 5% of the company through successive public offerings. As a fully-public enterprise, PBF spread its wings in 2015 with the acquisition of the Chalmette facility in Louisiana for $322 million. The transaction closed in November of 2015 and brought on board 189,000 bpd throughput capacity with a Nelson Complexity Index score of 12.7. PBF pounced on the opportunity as Exxon Mobil (NYSE:XOM) and Petroleos de Venezuela exited the business. The new capacity added to PBF’s facilities in Toledo, Delaware City and Paulsboro, New Jersey. Chalmette’s total price of $565 million included the acquisition of $245 million in inventory and working capital. Chalmette was a bargain purchase at $1,700 per barrel or less than $200 per complexity-barrel. The facility provided PBF with valuable exposure to the Gulf Coast. PBF moved quickly to capitalize on another XOM divestiture late in 2015 by entering into an agreement to purchase the troubled Torrance, California refinery for $537 million. The transaction closed on July 1, 2016 and added 155,000 bpd capacity (14.9 NCI) in the critical West Coast Market. California has the most stringent environmental regulations but the Torrance refinery supplies 20% of the lucrative Southern California market. Like Chalmette, PBF has taken advantage of XOM’s need to shed assets. The refinery was purchased for the inexpensive price of $3,500 per barrel or about $235 per complexity-barrel. What’s more, PBF has purchased a refinery which has undergone extensive capital improvements that enhances compliance with the strict California environmental laws. Torrance was infamous for an explosion in early 2015. Subsequently, XOM spent over $160 million to bring the facility back up to speed before selling to PBF. The acquisitions have raised PBF’s throughput capacity to 884,000 bpd and they have earned a national reach with very reasonable allocations of capital. The table below ranks major independent refiners by throughput. Using a metric of enterprise value divided by throughput indicates that PBF is much less expensive than its peers. Valero, with an enterprise value of $28 billion has 2,200 kbpd of throughput. Marathon (NYSE:MPC) has $31 billion of enterprise value for 1,731 kbpd of capacity. Meanwhile, PBF has an enterprise value of $3.27 billion for its 884 kbpd throughput. The chart shows that PBF sells for an inexpensive EV/kbpd ratio of 3.7. Admittedly, Marathon, Tesoro (NYSE:TSO), and especially Phillips 66 (NYSE:PSX) derive a larger portion of operating income from non-refining activities and make the comparison slightly less meaningful. Throughput capacity also doesn’t take into account the varying degrees of complexity indices and refining margins (as we will see later in a direct comparison with Valero). Still, the low multiple is hard to ignore. PBF also attracts attention because it sells for a price that is in line with the value of its assets. 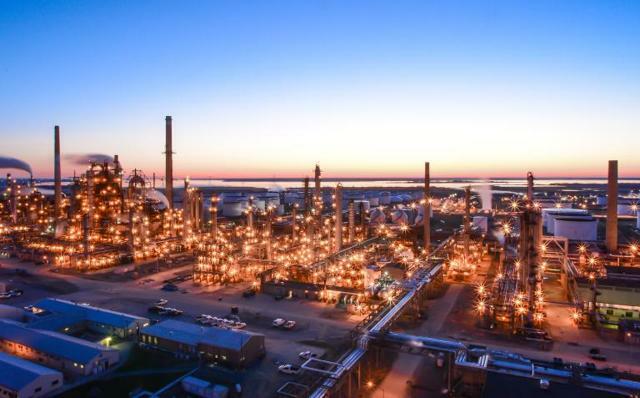 Recently, LyondellBasell (NYSE:LYB) announced that it would sell its refinery in Houston with a 270,000 barrel per day capacity and an NCI of 12.5. Industry experts expect the transaction to reap as much as $1.375 billion using a metric of $5,000 per barrel. The leading candidate to purchase the Lyondell refinery is Saudi Aramco (AMRCO). Of course, one should apply the caveat that the Saudis may be on the verge of overpaying as they seem to be in a desperate mode to diversify assets away from the declining crude reserves at home. Let’s take a broad swing of the axe at the PBF assets: If one employs a price of $4,250 per barrel for the 884,000 bpd refining capacity, the gross value is $3.76 billion. Now subtract the debt of approximately $1.83 billion. The net result is $1.93 billion of refining capacity value. Critically, PBF also owns approximately half of its pipeline and transport affiliate PBF Logistics (NYSE:PBFX). The market capitalization of PBFX is roughly $832 million. Adding the half of PBFX to PBF’s net asset value noted above, the sum of all parts equates to $2.35 billion – well in line with the current market price for PBF equity. Refiners produce profits by reaping the spread between crude oil inputs and refined outputs. “Cracking” hydrocarbons for gasoline, diesel and LPG generates a profit per barrel. The crack spread has trended downwards since early 2016 in fits and starts, and hovers around $12 today. In fact, the recent pop above $12 was only the result of a temporary pipeline leak at the beginning of September. Gasoline inventories have risen, while crude stocks have fallen. Crack spreads during the past four years have shown declines as peak driving season inventories are built. Spreads touched $43 in early 2013, $26 in early 2014, $33 in the first quarter of 2015, but only $22.50 early in 2016. A refiner has to pay overhead and operating expenses after it yields the crack spread. For PBF, operating income margins (before taxes) measured approximately 6% in 2015 (note: the author added back a $427 million inventory adjustment), but only 3.44% during the first half of 2016. The 2016 margin indicates the extent to which the petroleum industry faces pressure as it unwinds surplus inventory. In 2015, PBF received net income of $195 million. Adding back depreciation of $207 million and an inventory markdown of $427 million plus other adjustments provided $703 million of cash. The pressure on capital expenditures is high for refining facilities and the annual turnaround costs are immense. PBF required over $407 million in capital expenditures during 2015. The company also pays out 5% of cash flow to the non-public shareholders. This amount totaled $42.2 million. Out of the $254 million remaining, $106 million went to dividends. Unfortunately, PBF also had negative working capital of $338 million. While this may be excessively high due to inventory management related to the Chalmette acquisition, it also suggests that the dividend is not a certainty. PBF offers a robust 5.3% yield, but the elevated level reflects some inherent risk recognized by the market. Finally, the refining industry faces a high degree of uncertainty related to environmental compliance regulations. The industry awaits final guidance from the EPA and additional capital expenditures may be required. The table above indicates that pressure on operating cash flow continued in 2016. 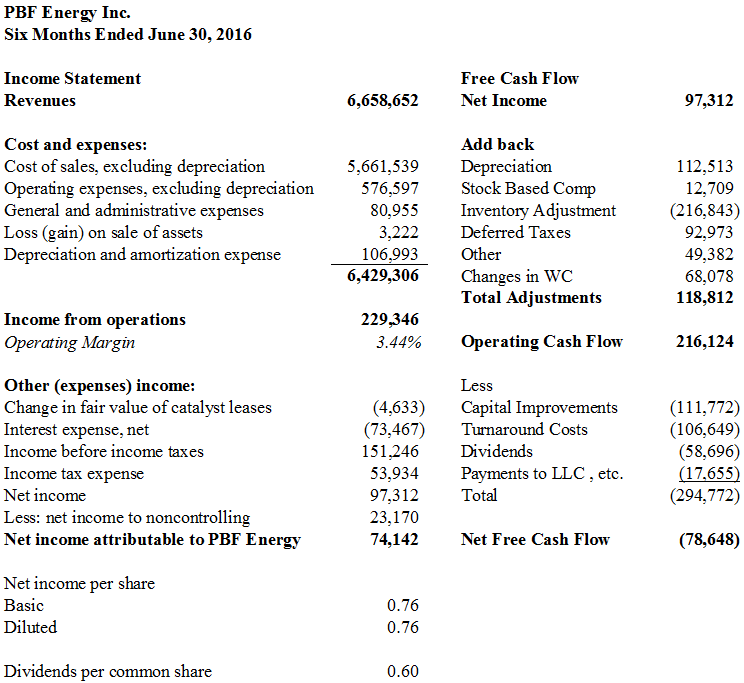 Free cash flow after capital items and dividends approached negative $80 million. Certainly, the Torrance facility will help these numbers during the second half of the year as well as the addition of a new storage tank at Chalmette. One doesn’t have to look far to see the challenges facing the industry. The refining margins for the first half of 2016 dropped dramatically from $10.29 per barrel to $5.77. Management recently highlighted the constrained market and also noted that operating expenses will be at the $5 level for 2016. On the plus side, management also touted the benefits of the Torrance acquisition by emphasizing that it will add about $360 million of EBITDA. The chart below presents historical margins and actual numbers through June of 2016. The author made projections for the remainder of 2016 with an added column showing the accretive contribution from Torrance as will the addition of a new storage tank at Chalmette. Simply put, Valero has better gross margins. Valero also has lower operating expenses. The following is a comparison of 2015 numbers between the two refiners. I added the Torrance EBITDA of $360 million at the bottom to make a comparison of enterprise value to EBITDA and price to EBITDA. Both measures show that PBF trades at a discount. However, given the margin advantage at Valero, perhaps the higher multiple is deserved. In all, PBF is probably the best option if you wish to add a refiner to your portfolio. Following Klarman is usually a productive bet. The refining capacity of the country has limited growth due to strong environmental opposition. Hence, PBF offers a proverbial “moat.” Miles driven by US consumers are steadily climbing after plummeting in the latter half of the last decade. Gasoline is also largely immune to foreign competition (unlike crude). PBF trades in line with net asset value and at a discount to Valero. If PBF can improve margins, Klarman’s wager will pay off handsomely.